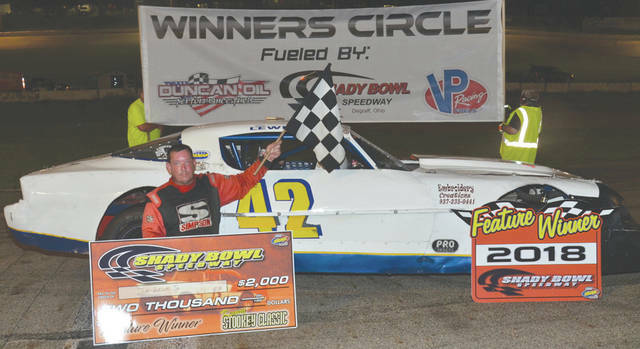 Jim Lewis Jr., of Fairborn, holds the checkered flag and the winner’s check for $2,000 after winning the Kenny Stookey Classic Street Stocks race, July 14 at Shady Bowl Speedway in DeGraff. BEAVERCREEK — Beaver-Vu bowling lanes, located at 1238 N. Fairfield Rd, will host the annual 9-Pin “No-Tap” Charity Challenge on Saturday, July 21. Three days of qualifying begins at Beaver-Vu and carries on at Pla-Mor Lanes starting on Thursday, July 26. Re-entries are allowed. The top 24 qualifiers from each center will advance to the Championship Finals on Sunday, July 29 at Pla-Mor Lanes, located at 4901 Linden Ave. in Dayton. No fewer than two women and two youth bowlers are guaranteed to advance from each center. Based on 250 entries, first place will award $1,000, and all 48 bowlers advancing to the finals will cash. The charity event will benefit Dayton Children’s Hospital. All of each bowlers’ $25 entry fee will be donated to Children’s, with 100 percent of the prizes to be paid by Beaver-Vu and Pla-Mor. Entry forms are available at both bowling centers. To download an entry form, please visit daytonbowling.com. Walk-ins are permitted.